In this column, I have reviewed 32 books so far careful to find in what each had to say passages, directions and conclusions with specific application to leading an association. With these two selections, I am doing something more general – theorizing that to lead an organization of any kind you must understand as much as possible about the world you and those you are attempting to lead live in – how it got to where it is and where it’s going. In reading non-fiction especially, we credit an author who brings us clarity. 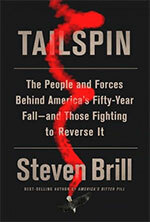 At this point in our history when we seem to be more divided than ever before, Steven Brill, the founder and publisher of The American Lawyer, agrees that there is a divide, but not with where most of us think the dividing line falls. It’s not between Republicans and Democrats, or any of the polarized portions of the population we so easily label. It is between the Protected and the Unprotected. He explains to us how well-meaning democratic reforms, the rise of political money, the competence of armies of lawyers, and corporate financial short-term thinking have created moats, the most serious one separating the middle class from the American dream. He painstakingly articulates the cost of unintended consequences but does not leave us there. He goes on to describe efforts to reverse the trend as the subtitle of his book promises. This is an impressive piece of investigative reporting that will enrich your understanding of the forces at work all around you. And what doesn’t work. Let’s pause a moment, and then take a step forward. The pause is the present. The step forward is into the future. This is the third book of Harari’s I have read. What propels them for me is the author’s unique way of making connections and seeing common structures invisible to us that once articulated make perfect sense to the reader. In this book, he devotes one chapter to each of twenty-one lessons. It would be too much to go into all or even some of them in this short space, but the chapters on work, liberty and equality deserve the attention of association leaders. The author gives us a deep discussion on how this time around there are good reasons to expect that the effect of automation on the workforce will be a real game changer. Depending on the kinds of organizations that make up your member base, his prognostications might greatly reduce the number of workers needed. He is eloquent on how the “confluence of infotech and biotech” expands the things that machines will do that were previously considered the unique province of humans. We easily understand just by looking around what he means when he says every routine is an invitation for disruption. The biggest challenge will be how we reconstitute an economy where there are fewer jobs for humans. In the chapter on liberty, there is a brilliant observation a la Harari about how feelings are not the opposite of rationality, but how they embody “evolutionary rationality” and are key in every election and referendum. Humans are used to thinking of life as a drama of decision-making, but increasingly, developments in artificial intelligence show us that it is something else. We confuse intelligence with consciousness. Developments in artificial intelligence and big data may mean that machines can answer questions with greater accuracy than humans (think Watson on Jeopardy) and make previously impossible diagnoses due to the sheer rapidity of pattern recognition on a scale never thought possible, but this does not mean the machines will develop consciousness. So, if there are fears, it’s not that the robots will rise up and use their superior powers to overcome their human masters – the plot of many popular movies and TV series – but that some humans will use the robots to control other humans. Showing the breadth of his understanding, Harari reminds us that in ancient times wealth and power meant controlling land. In the modern era, machines and factories became more important than land. In the twenty-first century, he who controls the data owns the future. As leaders of associations, you are the guardians of data and how you handle it matters greatly to retaining the trust of your constituency. 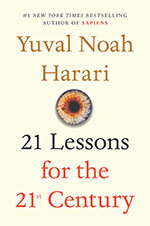 In a chapter entitled “Community,” Harari reminds us that humans have bodies, a curious observation to say the least. But everything we do online is designed to distract us from this fact. But it cannot change it. He reminds us that physical communities “have a depth virtual communities cannot match.” So, don’t give up your trade show.